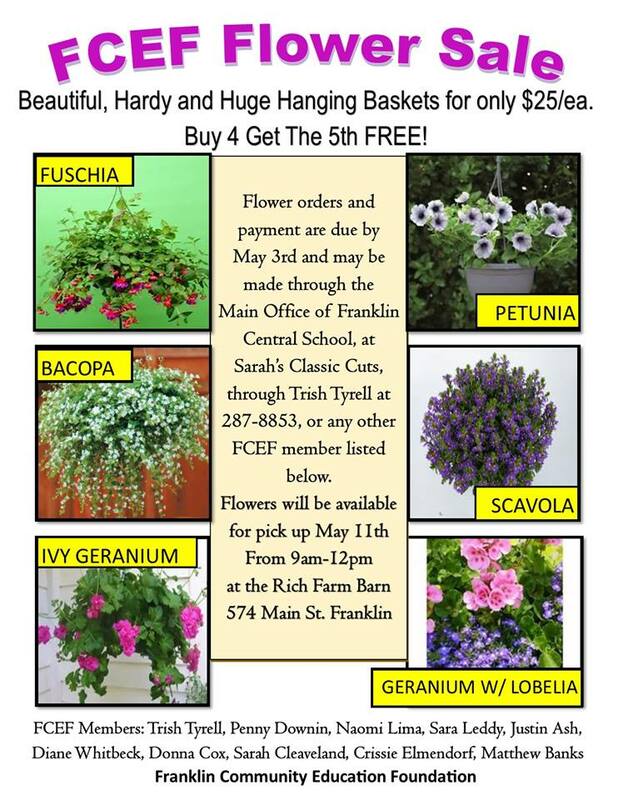 The Franklin Community Educational Foundation is once again selling hanging flower baskets of various types and colors for spring and Mother’s Day this year. The Education Foundation appreciates your interest and support over the years as we endeavor to support our youth grades K-12 to achieve academic success and opportunity. Your Save Our School letter writing campaign helped influence State Legislators by making them aware of how the Gap Elimination Adjustment is unfair to small, rural schools. You matched the monthly “Certificate of Excellence” scholarship award sponsored by Tom Morgan & Erna Morgan McReynolds. Eight $100 certificates were presented to FCS students in the past school year. You sponsored student Field Trips to the American Museum of Natural History in New York City for 40 students, to the Gilboa Dam, to the State Capitol in Albany and to the MOST Museum in Syracuse. You helped send the FCS Forensics Team to compete in Philadelphia. You created a “Benevolent Fund” to provide students in need with financial support so they can participate in field trips, buy school supplies and take college credit courses. You’ve donated happily to the Coins For Kids collection boxes in local businesses. You’ve contributed to a program that gives free backpacks packed with school supplies to students in need. You’ve helped support a twice monthly after-school program for kids. You raised over $5,000 this year alone, helping all FCS students compete on an equal footing with big city schools. Imagine what you’ll do next year!